In the days following his death, the family of Kentucky State Police Trooper Eric Chrisman found notes on his desk that Eric wrote outlining his commitment in the line of duty. 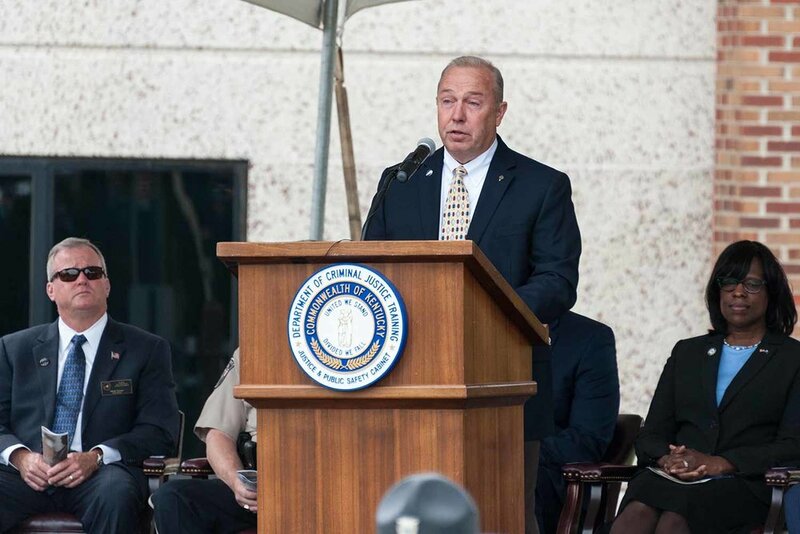 During the 18th annual Kentucky Law Enforcement Memorial Ceremony, the elder Chrisman shared with the crowd how those words embodied his son, who was killed June 23, 2015, in a car wreck just six months after beginning his law enforcement career. He was 23. Kentucky celebrated a year without any line of duty deaths in 2016. This year’s ceremony honored three peace officers who died in previous years, but whose names only recently were added to the National Law Enforcement Officers’ Memorial. Versailles Police Officer George Freeman, end of watch: June 17, 1883; Oldham County Police Officer Charles D. Howley, end of watch: May 14, 2014; and Bell County Sheriff’s Deputy Frank Bowman, end of watch: Aug. 6, 1932, were honored among their family, friends and comrades. Chrisman culminated the event’s speakers with his emotional testimony about his son’s commitment and devotion to serving the commonwealth. That same commitment to service among the commonwealth’s law enforcement was recognized by both Kentucky Lt. Gov. Jenean Hampton and Justice and Public Safety Cabinet Secretary John Tilley. Hampton echoed Tilley’s statement, noting that law enforcement often is unfairly demonized in America, and the sacrifices made each day by the commonwealth’s officers are not appreciated enough. Hampton recalled one of her first official duties as lieutenant governor was attending a visitation in November 2015 for fallen Richmond Police Officer Daniel Ellis. 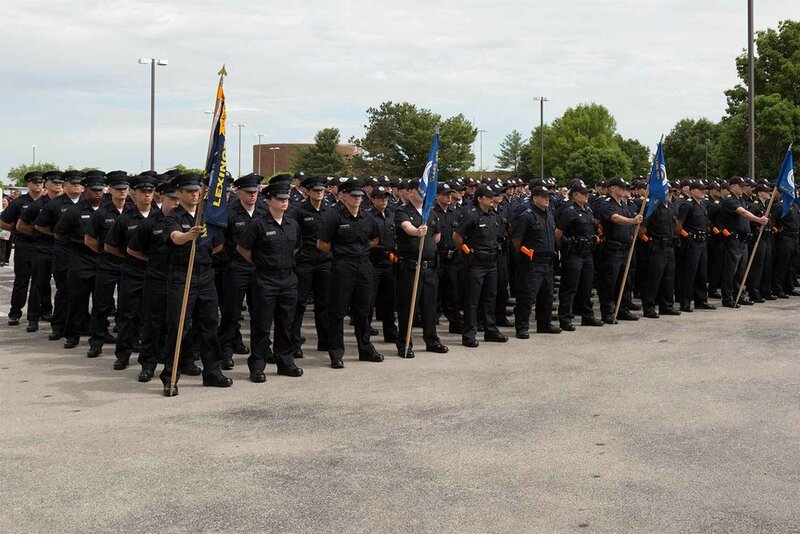 Hampton spoke of most recently attending a similar memorial for Louisville Metro Police Officer Nick Rodman, who was killed in the line of duty March 29. “They were just so young,” Hampton said of Ellis and Rodman. “It brought home to me the sacrifices you all make as law enforcement officers. That you put your lives on the line every time you go out, and you don’t know that you will come home. I pray that you do. This year’s ceremony included special music from Louisville Metro Police Department Pipes and Drums, Kentucky United Pipes and Drums, bugler Chris Conley with the Maysville Police Department and vocalist Debra Nantz with Lexington E911. The Oldham County Police Department Honor Guard presented colors. The Richmond Police Department conducted a 21-gun salute. The Kentucky Law Enforcement Memorial monument is the only monument in the commonwealth that recognizes nearly all Kentucky peace officers who have been killed in the line of duty. This year’s additions bring the total number of names on the monument to 536. The memorial foundation was established in 1999 to build the unique memorial. Once the monument was completed in 2000, the organization expanded its efforts to include an ongoing financial endowment program, which helps Kentucky peace officers and their families with educational, medical and emergency needs.